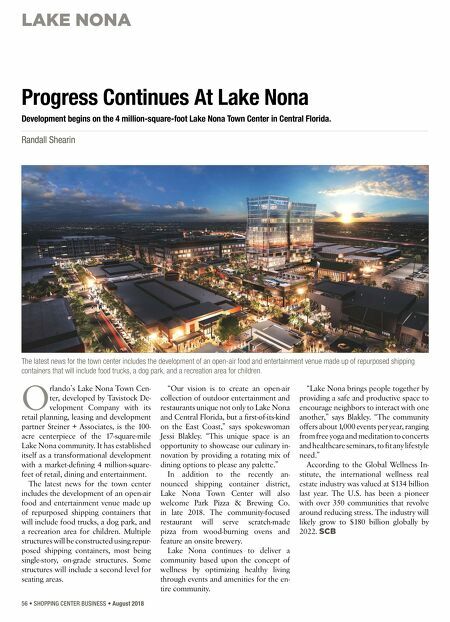 LAKE NONA 56 • SHOPPING CENTER BUSINESS • August 2018 O rlando's Lake Nona Town Cen- ter, developed by Tavistock De- velopment Company with its retail planning, leasing and development partner Steiner + Associates, is the 100- acre centerpiece of the 17-square-mile Lake Nona community. 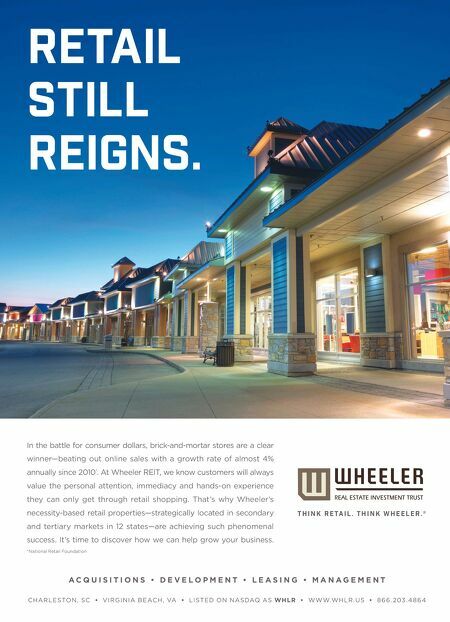 It has established itself as a transformational development with a market-defining 4 million-square- feet of retail, dining and entertainment. The latest news for the town center includes the development of an open-air food and entertainment venue made up of repurposed shipping containers that will include food trucks, a dog park, and a recreation area for children. Multiple structures will be constructed using repur- posed shipping containers, most being single-story, on-grade structures. Some structures will include a second level for seating areas. "Our vision is to create an open-air collection of outdoor entertainment and restaurants unique not only to Lake Nona and Central Florida, but a first-of-its-kind on the East Coast," says spokeswoman Jessi Blakley. "This unique space is an opportunity to showcase our culinary in- novation by providing a rotating mix of dining options to please any palette." In addition to the recently an- nounced shipping container district, Lake Nona Town Center will also welcome Park Pizza & Brewing Co. in late 2018. The community-focused restaurant will serve scratch-made pizza from wood-burning ovens and feature an onsite brewery. Lake Nona continues to deliver a community based upon the concept of wellness by optimizing healthy living through events and amenities for the en- tire community. "Lake Nona brings people together by providing a safe and productive space to encourage neighbors to interact with one another," says Blakley. "The community offers about 1,000 events per year, ranging from free yoga and meditation to concerts and healthcare seminars, to fit any lifestyle need." According to the Global Wellness In- stitute, the international wellness real estate industry was valued at $134 billion last year. The U.S. has been a pioneer with over 350 communities that revolve around reducing stress. The industry will likely grow to $180 billion globally by 2022. SCB Progress Continues At Lake Nona Development begins on the 4 million-square-foot Lake Nona Town Center in Central Florida. Randall Shearin The latest news for the town center includes the development of an open-air food and entertainment venue made up of repurposed shipping containers that will include food trucks, a dog park, and a recreation area for children.